In celebration of All-Hallows-Eve, the Coin Collectors Blog presents some of the 2011 numismatic trick-or-treat. TREAT: If you were able to order your set, it should be a fantastic collectible. TRICK: There is never a good way to handle certain personnel issues. But regardless of whose feelings were hurt, the last statement issued by the ANA Board of Directors was unnecessary, uncalled for, and really lacked and an adult approach to a tough situation. TREAT: The ANA actually using social media to reach out to members and respond. TRICK: The ANA Board of Directors making a myopic decision on how to handle club tables at their shows. Rather than make simple rules saying that the tables must be staffed at all times except during meetings, the Board went beyond reasonableness and added restriction as to how many clubs could share a table. TREAT: A regional organization could have one table with the support of member clubs and tangentially fit within the rules. After all, these are “members” under one umbrella organization and only members will be staffing the table without violating the ANA’s ridiculous rules. TRICK: National Public Radio did a highly inaccurate story about how the Federal Reserve is holding more than $1 billion in dollar coins in its vaults costing the taxpayers money. TREAT: Rep. David Schweikert (R-AZ) introducing H.R. 2977, the Currency Optimization, Innovation, and National Savings Act (COINS Act) to transition the U.S. from paper dollars to coins. Add to this the unconfirmed rumor that the “Super Committee” is considering adding this to their final bill. TRICK: Since the resignation of Ed Moy as Director of the U.S. Mint, the position has gone unfilled. TREAT: Since being hired as Deputy Director on January 25, Richard Peterson has lead the U.S. Mint in a professional manner questioning whether the U.S. Mint really needs a politician as a director. As for the problems occurred while ordering the 25th Anniversary American Silver Eagle Set, it could be said that the systems not being able to keep up with the loads are a residual problem left over from the previous director not managing the technology properly. TRICK: As a concept, the Citizens Coinage Advisory Committee’s report “A Blueprint for Advancing Artistic Creativity and Excellence in United States Coins and Medals” should not be controversial. However, it seems that the CCAC has found two ways of making a good idea irrelevant. First, the CCAC, whose first “C” stands for Citizens, forgot the citizens. They created the report and did not ask for comment from the citizens. Even though I provided comments, I was basically told, “Thanks, but no thanks.” It would be nice if they were inclusive. The other TRICK was that the report has appeared to have become shelfware—a document sitting on the shelf without impact. TREAT: Even with the issues in the report, it is a step in the right direction and should be something the U.S. Mint should be working on now! What are your numismatic trick-or-treats for 2011? 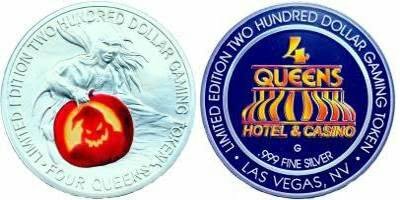 Image is of a 2007 $200 commemorative casino token from the Four Queens Hotel & Casino, Las Vegas, NV. Image is courtesy of the Silver Strikers Club. Details of this token can be found on the Silver Strikers Club website. On Thursday, the U.S. Mint posted an announcement looking for applicants for two people to be appointed to the Citizens Coinage Advisory Committee (CCAC). The CCAC is one of the advisory committees that reviews designs for coins and medals produced by the U.S. Mint (the other is the U.S. Commission of Fine Arts). One of the open positions is for someone who is qualified in numismatic curation. This person would be someone who has been trained for or is working in an environment where they select, organize, and maintain a collection or exhibit. Most curators work for a library in their special collections department or a museum. There are some curators who work with private collections and foundations. The other open position will represent the interest of the general public. In recent history, the person filling this position has been a coin collector but the person who is appointed to this position does not have to be a collector. An interest in coin design would be a great asset. CCAC members serve four year terms and are considered Special Government Employees. CCAC members are not paid but can have travel expenses reimbursed at standard schedule rates. As a government employee, CCAC members are subject to conflict of interest laws and ethics regulations. Individuals wanting to be considered for appointment as the CCAC member who is specifically qualified in numismatic curation or as a member representing the interests of the general public, should submit a letter, along with a resume or curriculum vitae, detailing specific educational credentials, skills, talents and experience. Applicants must specify the position for which they would like to be considered. Applications should be submitted by fax to 202-756-6830, or by mail to the United States Mint, 801 9th St., N.W., Washington, DC 20001, Attn: Andrew Fishburn. Submissions must be postmarked no later than September 15, 2011. Good luck to any applicant! Last week, the U.S. Mint announced that they are accepting applications for a new member to the Citizens Coinage Advisory Committee. They are looking for someone who is specifically qualified in numismatics. I urge members of the numismatic community who may qualify “by virtue of education, training or experience” and would like to see the CCAC have a real positive impact on coinage design to apply for the position. I hope you can work with the committee but provide a strong perspective to promote good designs. If you are willing to find ways of opening up the CCAC to make it more accessible to the public including pushing the U.S. Mint to make materials more available to the public, then you will get my support. Before commenting on the CCAC Blueprint Report, I would like to note that the report has not been formally published by the U.S. Mint. It appears that the report was sent via email to a number of people who requested a copy. When I received a copy, I posted it here for the public to see. It appears as if the U.S. Mint takes an arms-length approach to the CCAC with regard to its support which shows in the lack of public information disseminated about the CCAC. While I appreciate the U.S. Mint Public Affairs Office sending a copy of this report, they should be more proactive in providing information about the CCAC to the public. Also, it is not known whether the CCAC is accepting comments about the report. Page iii indicates that this is a final report and was transmitted to the Secretary of the Treasury. This is a shame since the document should clearly have been reviewed by others before its transmittal. While they could reject comments, accepting reviews from another perspective may have been helpful to tighten their sound recommendations. Since they have not indicated whether they are accepting public comment, I am providing my commentary in this blog post. I will be contacting those CCAC members whose email address I know and point them to this commentary. I ask that they share this with the other CCAC members. They are invited to provide commentary to this blog post or contact me privately for further clarification. I am willing to help in anyway I can. As with all my blog posts, comments from my readers are always appreciated! Is the U.S. Mint Hiding the CCAC Coin Design Report? While watching the live coverage of the situation in Cairo, Egypt, I was marveling how we can see history being made while it was happening. Earlier this year we watched a populist uprising in Tunisia that forced a change in the government broadcast around the world. A few weeks ago when a gunman shot Rep. Gabrielle Giffords, the news was so fluid that watching the news on Twitter became the best way to keep up with the developments. Technology has brought a new world of instant communication to anyone who wants the content. News junkies, like myself, are thrilled! Unfortunately, this type of communication has been lost on the U.S. Mint. On Wednesday, February 2, it will be two weeks since the Citizens Coinage Advisory Committee introduced and adopted as its recommendation the report “A Blueprint for Advancing Artistic Creativity and Excellence in United States Coins and Medals.” As of the time of this writing, the report has not been made available on either the CCAC’s website or the website for the U.S. Mint. It must be emphasized that this is the fault of the U.S. Mint. According to CCAC member Donald Scarinci on Twitter, they were “told that it will be posted on the ccac website.” It was confirmed that after the meeting, CCAC Chairman Gary Marks urged the U.S. Mint to have the report posted online immediately. According to Presidential memo, “Transparency and Open Government,” government should be transparent, participatory, and collaborative. Keeping it off line is not transparent, does not allow participation by the citizens, and does not allow for the collaboration between a government mandated committee (the CCAC) and the “citizens” it is to represent. In short, the U.S. Mint is not doing its job. I know the weather around the Washington-area has not been the best, but we are not talking about snowmageddon-like conditions we had last year. But according the Office of Personnel Management the government is open. This means that the business of the government must go on including observing the President’s Memo regarding transparency and open government. I urge the U.S. Mint to post the CCAC subcommittee report immediately! If you are in the Washington, DC area, the Citizens Coinage Advisory Committee is meeting today in the 8th Floor Board Room a at the U.S. Mint Headquarters located at 801 9th Street NW. Although Moy resigned as director, the challenge remains. Earlier today, CCAC Member Donald Scarinci tweeted, “CCAC will hopefully adopt the design excellence subcommittee report today. The info in it might be shocking to some, but all accurate.” While wondering what was so shocking, I asked Scarinci if the report will be release to the public today. He said yes. However, given the low information aspect of the CCAC’s website, I hope the report is given prominent place on the front page. If you cannot attend the meeting you can follow along as Donald Scarinci tweets from the meeting. You can follow Donald at @scarinci on Twitter. According to the tweets of Citizens Coinage Advisory Committee member Donald Scarinci (@Scarinci), CCAC Chair Gary Marks announced the establishment of a subcommittee to help U.S. Mint Director Ed Moy to initiate his vision for a neo-renaissance of U.S. coins. Members of the subcommittee will be made up Mitch Sanders, Donald Scarinci, Roger Burdette, Heidi Wastweet, and Gary Marks. Their report due by October 31, 2010. Recently, Moy and the U.S. Mint came under attack from both the CCAC and the Committee of Fine Arts for the “overall disappointment with the poor quality” of the alternatives presented for the 2011 commemoratives,” as written in a letter to Moy from the CFA sent on May 28, 2010. During the 2010 FIDEM conference, there were reports that the design of U.S. coins were not up to the standard set by Moy during his 2007 talk. None of the attendees to the conference in Finland would comment for the record, but the off the record comments were less then complementary about U.S. coin and medal designs. Scarinci reported that “Support for the creation and mission of the historic first subcommittee of the CCAC is unanimous.” The CCAC included the May 28 letter from the CFA as part of their record. When Theodore Roosevelt became president in 1901, he initiated the “Golden Age of American Coin Design.” Using his bully pulpit, he held the designs of the U.S. Mint’s Chief Engraver Charles E. Barber in contempt and ordered coinage whose designs were more than 25 years old to be redesigned. Roosevelt was a fan of sculptor Augustus Saint-Gaudens and asked Saint-Gaudens to redesign the small cent. Rather than use the Liberty design in an Indian Headdress for the small cent, it was used on the 1907 $10 gold coin. Roosevelt also asked Saint-Gaudens to design the $20 gold double eagle coin to rival the beauty of all classic coins. With the decent of the political bureaucracy it would be impossible for a modern president to follow the example of Roosevelt. For those of us who lament the poor quality of the designs emanating from the U.S. Mint, we should support this new subcommittee and hope the figure out how to “fix” the processes and artistry of coin designs. Yesterday, the Citizens Coinage Advisory Committee met at the US Mint Headquarters in Washington DC. During the meeting, CCAC member Donald Scarinci set up his laptop and tweeted from the meeting. Based on Scarinci’s tweets, it was not a comfortable meeting. While reading the tweets, it seemed that there were some contention between the U.S. Mint and the members who blindly support whatever the Mint wants. Scarinci has indicated to me and in his commentary that appeared in Coin World that he was interested in performing the job intended by the law authorizing the CCAC. Following the meeting, comments from other members indicated that Scarinci’s statements that appeared in Coin World editorial was the catalyst for the contentious feelings experienced at the meeting. One member indicated that there were more tactful ways to make comments about other members. It is not apparent from the Coin World editorial what was objectionable in what Scarinci did or said. However, past experiences with CCAC Chairman Gary Marks may indicate that he takes commentary personally rather use it as a constructive lesson. If Marks and the U.S. Mint can realize that those who criticize are not against them but care enough to want to make things better there would be less of a strained relationship between the CCAC members and the public. UPDATE: I am not condemning or condoning Scarinci’s comments. I am saying that on the surface it does not appear that what he said rises to the level of scorn that is being raised. Regardless of how you feel about his situation, I encourage Scarinci to continue to work in a manner that he feels is in the best interest of the CCAC, even if it means trampling on a few egos. Scarinci On my way to DC for meetings later & CCAC meeting tomarow. Big agenda tomarow. Took a long time preparing. Scarinci Just read “Coin World” article with CFA’s comments on the commem designs CCAC reviews tomorrow. I’m not alone thinking they are unworthy. Scarinci Only 3 or 4 designs of each coin today–the Mint just engaging CCAC because they have to. Designs limited & most are variations of the same. Scarinci Arrived at mint. Franklin Pierce dollars for sale in lobby. Arkansas quarters too. Scarinci Administrative meeting just begun. It is of course not open to the public. Scarinci Admin meeting adjourned–Why does the Mint like to do things in secret? Very little discussed that couldn’t have been public. Scarinci Public just entered the room. Seems like a lot of people here for this meeting today. Scarinci Set up my laptop for twitter today. It is a lot easier on my thumbs. Scarinci Michael Ross, History Prof at U.Maryland being introduced (Historian seat on CCAC). teaches U.S.History and focuses on 19th Century. Scarinci Starting discussion of designs of 2011 Army Commem Coin Program. Kaarina Budow reading narratives that were given to the artists. Scarinci The gold reverse designs are three variations of the same thing. Guess that’s what the Mint wants. There is no choice. Scarinci Obverse 2 & 3 show central soldier figure wearing the current uniform. We are told it is not specific to any current military action. Scarinci Had a motion to narrow the discussion even though only 4 obverse designs being considered. No women depicted on any of them. Scarinci The three reverse designs of the gold coin are all the same with only minor variations. Even more absurd to narrow the discussion on these. Scarinci The gold is supposed to show revolutionary period to today. Ony 1 or 4 does that for me. But I don’t get the motto on 4. Scarinci Some support for design 3 because it is focused and fits well on the small surface of the gold $5. Scarinci Some members wanting to change wording on reverse & minor features of some obverses. Mint seldom listens to that. We get what we get. Scarinci Device on helmut on design 3 is for night vision and becomes the focus of the image. Some want to see eyes and people facing front . Scarinci Voting for the gold concluded. I made the point that we are just rubber stamping what the mint wants on the reverses–all the same. Scarinci Kaarina reviewing narratives for the silver dollar size 2011 US Army Commemorative Coin Program. Scarinci Some on CCAC are picking up on the fact that the faces depected on these designs look very much the same–diversity is lacking. Scarinci You gotta love Roger Burdette. He just articulated my thoughts on the wording and the banality of what we are looking at today. Scarinci Moved on to talking about the clad half dollar of the three piece 2011 US Army Commemorative set. Scarinci I spoke in favor of obv.1 or 2 paired with rev. 2 as a nice coin & made the comparrison to the rev. on the 1976 quarter. Same artist? Scarinci Good comment just made that the clad half obv. designs are very 1950’s “Atoms for Peace” remakes. There is little inspiration here. Scarinci Member just suggested that the good designs have been edited out of the group the Mint chose to send to CCAC. YES! Scarinci I just made a motion to reject all designs for the obv. & rev. of the clad half dollar. Roger Burdette seconded it. Motion failed. Scarinci Rick just made a motion to reject all obverse designs of the clad half dollar. Mike Olson seconded it, withdrew his second so I seconded it. Scarinci Good, spirited discussion. The motion passed with a 5-4 vote to reject all designs for the obverse of the clad half dollar. Scarinci Discussion about adjourning and considering the 2011 Medal of Honor coins at our meeting in Colorado Springs. Mint staff objected. Scarinci The CCAC did what the Mint wanted and is continuing the meeting. Lets just rush through it since there isn’t much to choose from anyway. Scarinci We are rushing through the agenda and looking at the Gold and silver commemorative designs together. Kaarina is even speaking faster. Scarinci One member just said they can’t even keep up with the pace of the meeting at this point. It is going in high speed. Scarinci We are at it now since 8 AM with not even a bathroom break. Thank goodness they brought some food and sodas out. Scarinci We haven’t even tallied the votes from the Army Commemoratives. Worrying now about my train reservation. Scarinci Roger and Mike have prepared very moving remarks about the medal of honor commems–truly a highlight of today’s meeting. Scarinci I will not be rushed on my comments and I will not lend my name on a vote on such an important coin as the medal of honor coin. Scarinci We got through this in about 1/2 hour. We are now taking a break finally to count the votes. Scarinci The Mint staff just told us they are not rushing us. Unbelievable! Scarinci I did not vote on the medal of honor coins because I refuse to be rushed. We just ran through it to comply with law requiring CCAC review. Scarinci Mike making some motions asking the mint to change design aspects of what we voted for. Scarinci CCAC just voted to make the woman on the Army Dollar, SO-O1, African American to make up for the lack of diversity on the designs presented. Scarinci Meeting has been adjourned. I need to rush to make my train. Scarinci VOTES for 2011 Medal of Honor Commems: Gold$5obv.#2=19; Rev. :#2=13; #1=11; Silver $1 Obv. :#2=24; Rev:#2=24. Two members did not vote. Scarinci The private administrative meeting that followed was even worse than the public meeting if that is possible. Things are very bad (IMO).